Manage the resource capability and work load more efficiently with the visual resources overview. 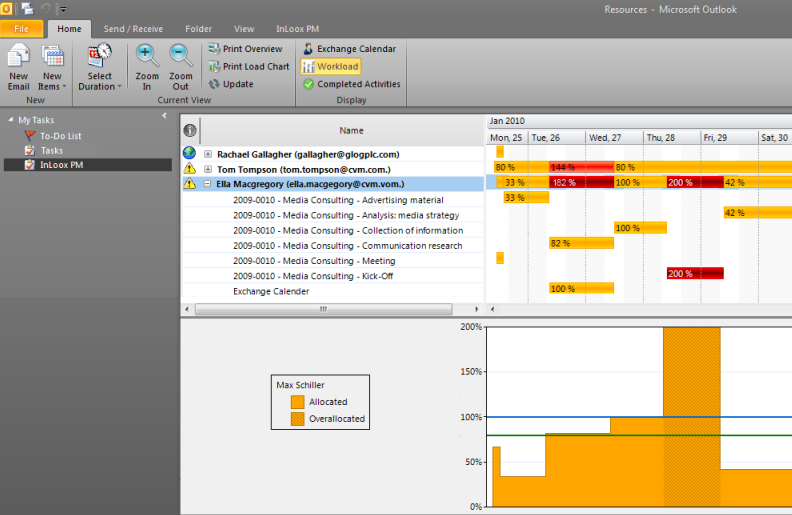 It integrates both project work packages from InLoox PM 7 and appointments from the Microsoft Exchange free/busy service. This way, you always have an instant and complete overview of all project resources – be it team members, rooms, or tools. In Outlook 2003/2007 click Extras in the InLoox PM Toolbar and choose Resources from the list. Add a resource To include another resource into the analysis it is necessary to add it. On the Start tab, in the Resources group, click Add Resource. In the Choose Resource dialog box, choose the required names from the list. Then click Select, Ok.
Use the feature Search by Skill to find select resources according to their skills. For more information, see Add project team members. Use this feature to always display resources with whom you work often, regardless of the filter settings. Remove a resource On the Start tab, in the Resources group, click Remove Resource to delete the selected resource from the view. Use this feature to always hide resources despite of the filter settings. Right-click the resource list in the upper left part. Select Display deleted resource(s) to display them again. Define time frames On the Start tab, in the Current view group, click Select Duration. Choose from the drop-down list between Today, Week, Month and Year. For more information about printing, see General features and printing of the project list, in the Print in the project list section. Show workload labels On the Start tab, in the Display group, click Workload Label. This option displays the work load in percent in the time bars. Show completed activities On the Start tab, in the Display group, click Completed Activities. All activities with the status "done" will be displayed, if this option is activated. How to optimize resource utilization with InLoox PM 7 • Copyright 1999-2019 © InLoox, Inc. All rights reserved.